It takes time to build a language both you and your horse understand. But by rewarding small steps in the right direction, you will advance your goal, and pretty soon you’ll be having a great conversation. Have you ever been awestruck by the sight of horses running together, galloping, synchronized side by side and turning together as one? For me, communication between a rider and horse should have that unity; it is all about becoming a herd of two. 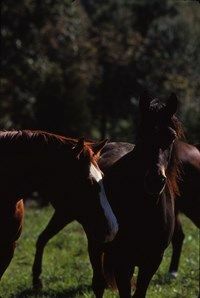 My first impressions about how horses communicate with each other in the herd began on the ranch when I was a teenager. I didn’t know or understand it then, but the “cavvy” (the cowboy’s herd of riding horses) and its interactions would set the groundwork for my lessons in intent and change the way I saw horse training forever. Back then, I didn’t get the subtle communication happening be-tween the horses right in front of me, let alone apply their valuable lessons when I tried to communicate with a horse. However, what I saw then influences how I play with horses today, now that I can interpret what the cavvy was saying. As a working cowboy, one of the most memorable and exciting things I did each day was to “jingle” horses. Jingling the horses simply means to go round up the cavvy before sunrise to get them ready for the day’s work, and it is a job often given to the newest member of the crew. Our cavvy was a herd of 40 horses pastured on 200 acres. Morn-ings at a ranch come early, with breakfast at 4 a.m. The rule was that horses were always fed before people. So that meant whoever was jingling went out even earlier to make sure the horses were at camp ready to be saddled before breakfast. On many occasions, that cowboy was me. I can still clearly remember riding out those mornings on the one horse left at camp, the “jingle horse,” who was used to help round up the cavvy. When I was there, the jingle horse was often an older one named Illahee. He was always keen to find the herd after a night alone at camp. Illahee and I would walk along quietly, trying to listen for the jingling bells that were tied to a few of the horses’ necks to signal the herd’s location. It always seemed like the herd stayed extra still then be-cause they knew if they were found, they were going to work. When we would finally track down the cavvy horses, I would let out a few hollers to get them all moving in the direction of the camp. In a very short time, it would turn into an exhilarating, eye-watering run down the side of the mountain. There was one left-hand turn that I knew I had to get the herd to make. If I could get on the herd’s right side and create enough energy, I could get the lead horse to flick her ear left. Then, all of them, at that very second, would flick their ears left and move as one toward the corrals. If I couldn’t get it done, they would slip off to the right and beat me to the turn. Then, it would be another 20 minutes to catch up and turn them back to camp. And, all the cowboys waiting for their mounts---having breakfast---would know the horses beat you. Looking back at the unbelievable interaction between all those horses running down a steep hill, dodging the trees, jumping the ditches, they operated as one using only intent. It was amazing to be a part of that each morning. Loving the rush of it, I wish I could have seen what was right in front of me. Wouldn’t it have been amazing to look left and have my horse go left just because of my intent to turn that way? Horses can clearly be that sensitive. Yet I would mount my horse for the day and pull on the reins with tens of pounds, like a plow, and think nothing of it. I thought that was just the way horses were---dull. It was years before I could see what was right in front of me: that the horse I was on was just as sensitive as that herd of horses and had the potential to listen that closely to me if I could be that sensitive to him. He was already so good at communication that while galloping down a hill in the dark, early morning hours, he could read a subtle ear flick of another. Horses learn this subtle communication right after they are born and use it with each other their whole lives. Yet, many have to put up with an ignorant person on their back who never realizes how sensitive they are. However, I like to think of horses as “Masters in Waiting.” The amazing part about a horse is, if his human gets better, he gets sharper. So, the horse you are on---even if he is seemingly thick, disconnected and dull at that moment---is actually a master just under the surface. It is up to you to access that sensitivity that every horse was born with. Liberty training can help you take that next step, enabling your horse to go from waiting on you to communicating efficiently with you. The way to true enjoyment with horses is leadership. It’s not just for increasing entertain-ment value; it’s also a safety issue. It’s great to have fun with a horse, but along the way we can get kicked in the head, bucked off, run over and put in the hospital. So it pays to be safe by learning to lead the conversation with your horse. Long-term equestrians will likely know what I’m talking about. We have all had our fair share of bumps and bruises along the way. Dealing with horses is a dangerous sport and no trainer or person can say that, with this technique or that technique, safety is guaranteed. But we can take steps to set ourselves up for success, including learning how to commu-nicate and how to be the leader. The risk with prey animals, like horses, exponentially increases when they don’t have the security of a good leader: When taken away from their home environment or away from their herdmates, it takes good horsemanship to help them become trusting and con-fident. A horse is not looking at the outfit you wear but what you can offer him to curb the prey-animal survival instincts. He is looking for someone to reassure him that he is safe and take care of him, leading him through any danger. Leadership is the most essential ingredient to successfully playing with horses in close proximity: on the ground, under saddle or at liberty. Without structure and respect between you and your horse, any horse activity has heightened danger, including liberty. Leadership is the path to a strong relationship and communication. There are no equal peers in the horse world. Horses naturally look for a leader. As prey animals, they survive by forming a herd and quickly determining the hierarchy. Through position, speed and sometimes force, they find their place among all the other horses. Every cue comes from the lead horse down the chain, with all the horses finding comfort in knowing whom to follow, and whom to cue next. It is quite a remarkable interaction between individuals---and among the whole herd. Even more incredible is that the lead horse can be a different one depending on the circumstance. When these split-second decisions happen, it gives the horse a focus, the same kind of focus a rider needs. In the wild or at pasture, every daily event revolves around the herd: each horse paying attention to the little cues, so as a herd they can sync. That is when things are at peace in the herd. The premise of human leadership is that I want my horse to look at me in the same way he looks at and keeps track of his herdmates. My goal is to win his trust in me to make the right decisions. Horses don’t just prefer a strong leader and a herd dynamic; they crave and need them. Without them, they are frightened and lost. Imagine a herd of horses out in the wild. If you take one away from the others to a different side of the mountain, that horse doesn’t remark on the tall green grass and the nice “alone time.” Instead, he uses his first set of basic survival instincts to get back to his herd. 1. Perception. He looks for the missing horses and becomes sensitive to anything that could hurt him while he’s alone. 2. Flight. While he’s in this heightened state of sensitivity, he will spook at anything that rustles or represents a danger to him. 3. Herd bound. Finding his herdmates, he will run back to the comfort of the group. You know your horse is without leadership when you take him away from the safety of his barn or yard or a herdmate, and those ears go out like radar antennas. Suddenly, some-thing your horse may have seen even a 100 times is scary and spooky. He begins to whinny and magnetically pulls back to the barn or jigs toward the horse trailer. 1. Fight. The horse pushes into pressure and resists. 2. Flight. Again, this instinct appears: He runs away. He uses full strength to leave, charging off with his rider and possibly running over bystanders in his panic. 3. Freeze. This is a way that a horse will use pent-up energy and explode all at once. It is probably the most common way horses gain control and the one that is most over-looked and misunderstood by people. Horses use flight, fight or freeze in an attempt to keep safe. They are not trying to be naughty or teach someone a lesson or embarrass people. It is instinctual, and they do it in order to survive. It is important to understand that horses in this mode are looking for help, looking for a good leader with the right attitude. What sticks out to me the most about the best horsemen and -women I know is their similar attitude about horses. They don’t take things personally. The horses they handle and train don’t dictate their emotions. They remain in control, even optimistic and friendly, when things are not going their way. They are also able to be surprisingly firm but not mean, and their horses can tell the difference. Learning to be sensitive and caring to a horse in one moment, then firm to establish a boundary in the next, can be really hard for some people. It feels to them like it is going against their nature. Some don’t want to be kind to a horse because they think they’re going to be looked at as weaklings. Others don’t want to be firm because they think their horse will hate them. I can tell you from my own experience that if we are to get anywhere with a horse we must find that balance in ourselves. And I know that each person with enough desire to truly excel with horses can do it. I also know with absolute certainty that no great horseman I’ve met was ever born with all of these qualities in perfect balance. They worked at it, studied horsemanship and took responsibility for each session, and the next time they walked into the pen with a horse, they tried to be better. Once a hierarchy is established within the herd, the herd operates as a single unit. They seem to move together by intuition, flawlessly changing direction and speed as a group. You can view a similar phenomenon in a flock of birds or a school of fish. The herd unit is comfortable to the horse. He wants to know where he fits inside it. That way, he knows how to react to each individual: whom he needs to listen to and who will listen to him. Of course, people do not naturally operate as a single unit like a herd of horses, flock of birds or school of fish. We must teach ourselves to communicate like a horse and to always have a sweet spot in mind for the horse to find. If he cannot find a sweet spot, the horse will revert to his base survival instincts, becoming either oversensitive or dull in self-defense. Imagine a rider pulling on the bit, kicking with his legs, and pump-ing with his body to tell his horse to go. But when the horse moves, the rider doesn’t let up. To the horse, this means he hasn’t done the right thing. So he tries going sideways and backward; but no matter what he tries, he gets no relief or reward---there’s no sweet spot offered. Eventually, he gets upset because he cannot find any comfort at all. The rider thinks the horse is being bad, when really he is just confused and miserable. Unable to find a sweet spot, the relief, a sensitive horse will get spooky and nervous, often bolting, rearing, prancing or generally seeming unable to stand still. A quieter horse is the opposite: He becomes unresponsive and disconnected, balky, even bucking when you ask him to move forward. If quiet horses are presented with enough pressure to get through their dullness, they often overreact and explode. But with good leadership and a sweet spot for your horse to get to, you and your horse will come into sync---into unity---just like in the herd. It’s a truly “wow” moment the first time a horse connects with you in unity. You move effortlessly together like the herd or the flock of birds. The more moments of unity you get with your horse, and the longer they become, the more your horse will trust you and come to find you as a place of comfort. He will learn that you are the source of his comfort and his sweet spot, and that people can supply him the unity of the herd---that things are being done with him instead of to him. Best of all, when he is faced with a scary or uncertain situation, he will look to you for guidance instead of reverting to his survival instincts. • Poor leadership. Without leadership, the horse will operate on his own plan and instincts. • Bad timing of the aids. This can be confusing to the horse and make him frustrated. • Ill-fitting tack or pain. If the horse is in pain, he won’t be able to find comfort. • Micromanaging the horse. If you are always applying pressure to the horse, he will never get comfort. To achieve unity, you must offer comfort the moment a horse is doing what you want, so he senses the relief of being in sync. Then those moments of unity can grow. This applies to every moment you are with your horse, whether on the ground or riding. “Feel” is a word that comes up often around horses. It’s notoriously difficult to teach and it can also be difficult to understand. Teaching it to students I liken it to holding a bird: If you grip too tightly, the bird suffocates; if you don’t hold tightly enough, the bird flies away. I think feel is in every person, but it can be elusive to find---sometimes very hard to dig out! I haven’t been able to teach it to everyone I’ve met, but it must be present to get anywhere with a horse. Feel is the single most important ingredient when communicating with your horse, and it binds everything together: For the person, the horse will never fully connect without you knowing feel. For the horse, he is born with feel in every cell, and he is just waiting for you to catch up. So what is feel? In short, it is an invisible connection. Feel gives you a subconscious understanding of what your horse is telling you at each moment and how to best commu-nicate with him. With feel, you know what aid to give, how strong it needs to be, the precise time to give it, and exactly when to release to reward the horse. Feel helps you know when you need to approach something differently and when your horse is ready to move to a different exercise or to a new challenge. The amazing thing about feel is you can give two people the exact same exercise with the same horse. With one person the horse softens, connects and gets the lesson. And, with the other, the horse gets tense, disconnected and thinks about the barn. I believe feel can be taught, or I wouldn’t teach my methods. It took me years to learn true feel, even after I had been riding and interacting with horses for decades. I had to dedicate myself to truly understand the horse and what he needed from me. Like communication, feel goes both ways. We need to learn to feel for him, and only then can we teach him to have a feel for us. For humans, though, feel can be difficult because we are dealing with a different species with a different energy and nature from our own. Also, many people won’t adjust, or don’t know how to adjust, to tailor what they’re doing to offer an individual horse better com-munication. They think there’s one way to give a command, and the horse will have to put up with it. If you are a dancer, you’ve experienced “good feel” and “bad feel” on a night out. Some dancing partners make you feel like you’re dancing on a cloud, and time flies by, while others make you feel as if you have cement shoes, and the end of the song can’t come quickly enough! Horses sense and have an opinion about the feel they are being offered at all times. Some-times it might be too heavy, dull and behind their movement. Other times it can actually be too light, not giving them enough to connect to. With sensitive horses, either way, poor feel drives them crazy: Whether too heavy or too light, they will become overreactive and frustrated with everything, including the brush you pick to groom them. When playing at liberty, I think of feel as a “string” running between my horse and me---it’s a connection without any rope. With good feel, we can move in harmony, keeping the string connection slightly taut and communicating easily. But if either my horse is or I am lacking feel, the string will either go slack or get too tight and break, and neither of us will understand what the other means. I believe that horses get irritated if we are always breaking the string of communication. To advance your feel, you must focus on becoming a master of communicating using in-tent. Remember, intent is the subtlest of aids, as if the horse is reading your mind. In reality, the horse is reading the slightest changes in your body language, right down to how you shift your focus---the same way a horse reads his dam as a foal or reads the other horses in his herd. It’s important to understand that intent is not your energy level. Communicating “louder” or “bigger” does not make you easier to understand. If someone spoke to you in an alien language, would his jumping up and down and screaming the same words make you un-derstand their meaning any better? Clear communication with a horse starts in your mind. That thought be-comes a certainty through your body that the horse will read. Certainty is a feeling that comes out of you. It is a sureness that you are going in that direction and are going to do what you intend. It is backed up by your aids. Eventually your thoughts get to the horse sooner because you become easier to read and more believable. That is when your intent is starting to work. Now you are communicating like a horse. An intention is different from a hope. It is something that is going to happen. You may need to adjust and help the horse in another way, but in the end, you are going to arrive where you intended. It will take time for you and your horse to build up a language that you both understand. Remember that you never go from complete darkness to complete light immediately; there are plenty of degrees of brightness in between. Keep your eyes open for the slightest change on the horizon and you are sure to get there. Many times, especially early on, we miss opportunities to advance because we are waiting for a big change and we don’t notice our horse has already made a small step in the right direction. Because we don’t notice and don’t release, our horse concludes we must not have asked for what he tried to do; he may become confused and agitated because of it. If you can advance your feel to where you can recognize a mental “try” in your horse and see those small changes, you will find you can advance at a much quicker pace. When you reward sooner, you will see enormous changes ---more than you would have thought---and pretty soon you will be having a great conversation.